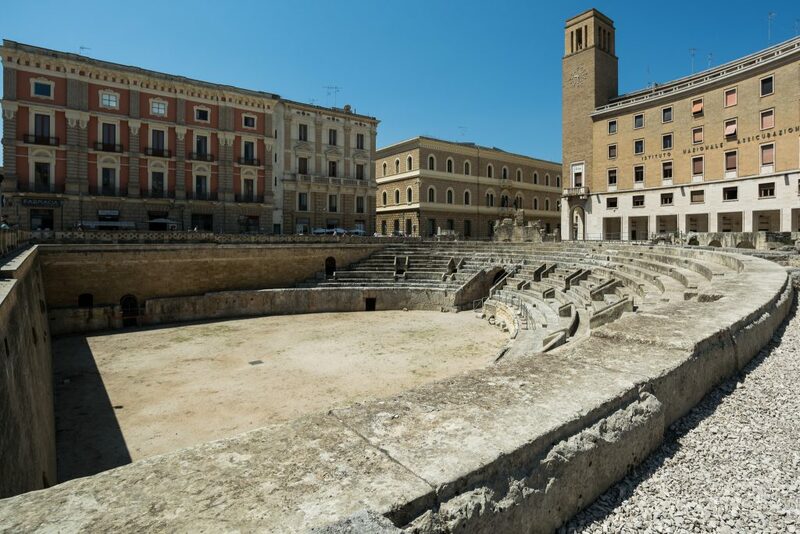 Located in the heart of Lecce, in Piazza St. Oronzo, the Roman Amphitheatre bears witness to the degree of importance achieved by the ancient city of Lupiae during the Roman Empire. Discovered in the early twentieth century, about a third of the original structure is now visible, showing part of the arena and cavea, while the remaining portion is hidden below the surrounding square and the buildings facing it. The monument, already located at the end of the nineteenth century thanks to occasional discoveries, was partially excavated at the beginning of the twentieth century, as part of the radical remodelling of the centre of Lecce, which included the demolition of the buildings known as the Isola del Governatore to make space for the construction of the Bank of Italy building. The archaeological excavations, started in 1900 by the archaeologist Cosimo De Giorgi and continued until 1940, have allowed the city to reclaim the part of the Amphitheatre visible today. The precise dating of the structure, used for gladiatorial combat and live hunting displays, is still debated today, but the most accredited hypothesis dates the original structure to the age of Augustus. Later restorations and improvements, including the building of the portico in summa cavea, would have been carried out during the reign of Hadrian. During the Early Middle Ages the remains of the Amphitheatre were probably reused as part of the city’s fortifications. At least from the 11th century on, the arena’s decorative elements began to be dismantled, as we can see from the chalice capitals reused in the crypt of the Cathedral of Otranto. Between the end of the fifteenth and the beginning of the sixteenth century, the remaining visible masonry structures were reused in the foundations of the Isola del Governatore complex, making the original remains invisible. On February 1st 1906, the day after its rediscovery, the Amphitheatre was registered in the list of Italian buildings declared as “National Monuments”. The Amphitheatre, an elliptical circus structure, measuring a total of 102 x 82 metres, was able to accommodate between 12,000 and 14,000 people. 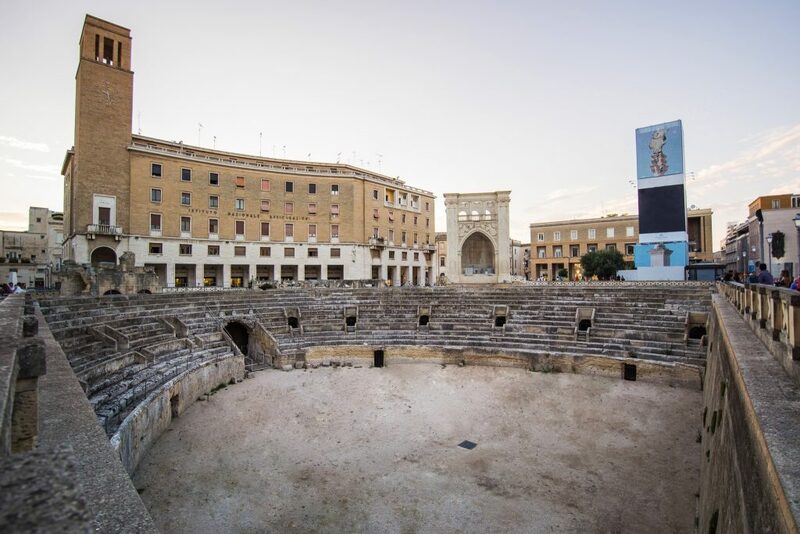 The structure is partly built in square blocks and cement, and partly excavated to fully exploit the mass of Lecce stone beneath to support the stepped seating, thus creating the arena, the lower ambulatory and the radial tunnels. The structure’s ground plan was divided into four sectors marked by four entrances that corresponded with the four main axes. At the level of the media cavea, access leads to the various sectors through a system of connecting stairs. The outer wall originally consisted of 68 arches, of which 24 pillars remain. The perimeter gallery on the second floor was probably surmounted by a portico, attributable to the Hadrianic phase, which is assumed to be the origin of various fragments of architectural decoration in Pentelic marble found in the coverings. The podium must also have been covered with marble slabs, while a continuous relief with venationes (hunting scenes) ran along the balteus, the parapet of the arena. The lower ambulatory contains the marble elements that constituted the crowning elements of the balteus: the continuous frieze, partially recomposed during restoration, presented a series of bas-reliefs with hunting scenes, fights between animals and combats scenes between bestiarii (beast fighters) and animals.